Step 1 Whisk together egg whites and buttermilk. Step 2 Dip slice of bread in egg mixture and grill until egg whites get that golden-brown look. Repeat with remaining slices. Step 3 Transfer bread to plate and smear cottage cheese on top (take it out of the fridge 15 minutes or so before serving, so it doesn’t make the bread cold). Step 4 Top with honey, blueberries and strawberries. Fit Factor: A few careful tweaks overhaul this meal’s nutrition—whole-grain bread provides fiber, cottage cheese adds a little protein, and egg whites (instead of eggs) lower the fat and cholesterol counts. 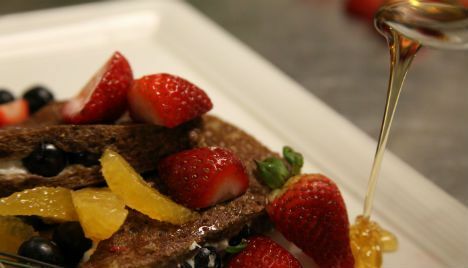 To make this Fit French Toast Recipe, make sure to look for high-quality pumpernickel bread, made with actual whole-grain rye flour (a darker appearance is a good clue), which is loaded with fiber and even some protein. And instead of maple syrup, the chef serves his toast with honey—harvested from 60,000 honeybees right on the ranch.